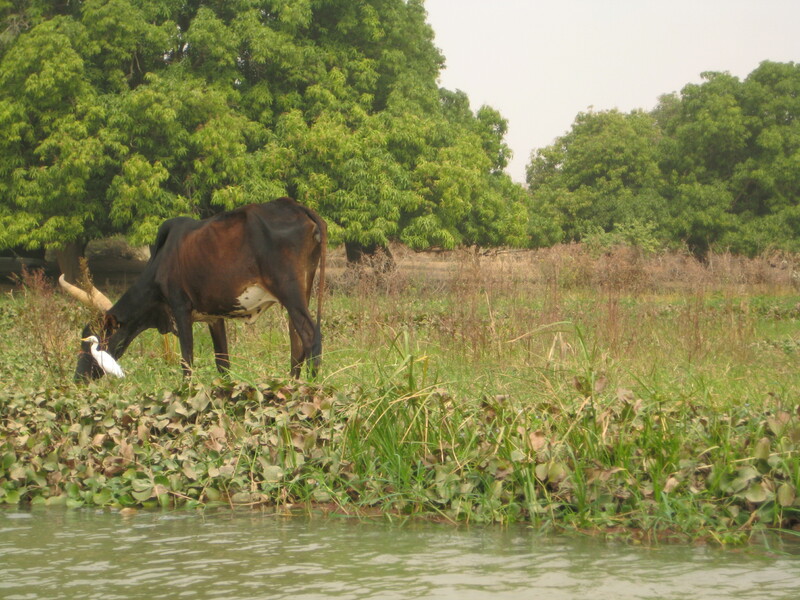 Last Sunday we spent the day alongside the Niger River at a campsite that several families rent together year-round. It is about 30 minutes outside the city, crossing vast expanses of desert wasteland, garbage-laden bushes and trees, dust-covered roads, and primitive mud-hut houses and ramshackle settlements. It is sobering, the reality of this poverty-stricken country in plain view. 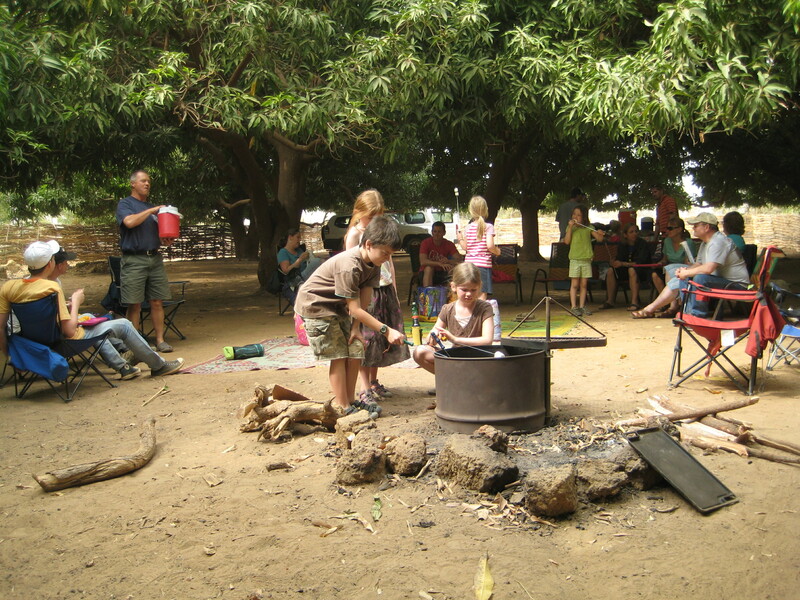 The Mango camp, so named for the many mango trees providing shade, is riverside and lovely. Not exactly Lake Chelan or the mighty Columbia river, mind you, but who’s comparing? There was a grill for lunch and the kids could climb the trees easily, while the adults visited or simply enjoyed the peace. Hippos are really really really really really BIG. Let me tell you how we found out. 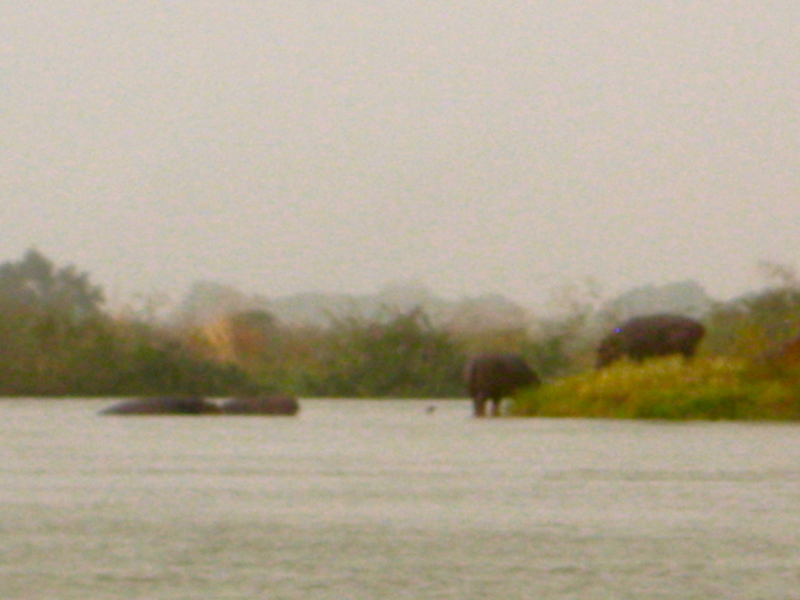 We took a little boat trip to find the hippos – something they do often around here. Apparently they haven’t seen the same episodes on Animal Planet depicting these creatures as unpredictable man-killers? Anyway, we went along with it….for the adventure. After tooling around the somewhat shallow waters for about 30 minutes and not finding the beasts, (although I have to mention that we did find an entire herd of cattle grazing in the shallow waters) our driver suggested going further south, although he didn’t know those waters as well…but he thought they might find the family of hippos there. (I was getting slightly uncomfortable, but not wanting to appear the wimpy mom, didn’t say anything). We saw beautiful African birds everywhere, remote villages along the shores, families bathing and washing, men working the fields, or simply resting in pumpkin boats…it was a slice of African life I never would have seen had we not ventured this way! Still the hippos eluded us. (All this time I wondered if they were right underneath us, ready to pop up! I seriously have watched those crazy animal shows!) We were almost ready to turn back when we spotted them – ON LAND – on an island about 125 yards away from us! Glory! This was what we were waiting for! Two “smaller” ones were in the water, and two large ones were on land, standing and moving around. It was incredible! We slowly drifted a wee bit closer, boat driver being cautious, I’m internally freaking out while taking pictures, and the hippos not noticing us. Then “BIG GUY” stands up on land near the now-medium-sized ones standing on the water’s edge. Seriously, I thought that it was a huge rocky part of the landscape until HE stood up! They all seemed to notice our presence and wimpy mom starts to sweat…uh, what are they going to do? Boat driver says (with a touch of nervousness, I might add) that it was time to go. Uh, ya. We reverse and the hippos stealthily slip into the water. Oh great – now we don’t know where they are! I’ve seen this on Animal Planet, people! They run like horses on the river bottoms! I am pretty sure we all were thinking the same thing – LET’S GET OUT OF HERE!!! Our boat driver skillfully maneuvered his way through the shallow waters, only grounding us once, retreating to a safe distance from the dreaded man-killers of African rivers! And I have some pretty cool photos to prove I am adventurous-mom, not wimpy mom! We made it to Niger! 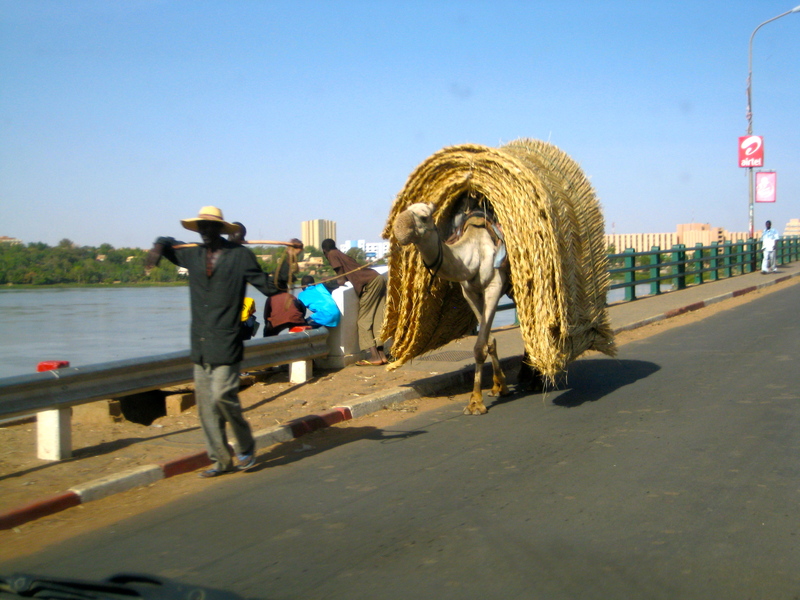 Since internet has been fluctuating lately I wrote this up – kinda lengthy but it gives our first impressions of Niamey. I hope to post pictures too — we’ll see if it goes through! Traveling: December 31st we boarded AirFrance to Paris, connecting to Niamey. Everything was smooth, no trouble with customs, and every one of our ten Rubbermaid boxes made it all the way to Niamey with us. Hooray! We all enjoyed our personal movie screens for the long flight, which took us over Canada & Greenland on our way to France. Our SIM friends (whom we’ve never met until now) met us at the airport, fed us dinner and promptly showed us to our temporary home…where the power was out and we got our home tour using flashlights! We were so tired and really didn’t care what the house was like at that point – just ready to try out the beds! Jetlag: it took us almost a full week to get on the right time schedule with our sleeping. We all seemed to wake around 1:00 am. – so we played scrabble, skyped some dear friends one night in South America, read books and watched movies until 4:00 – then went to bed again. One funny thing is that the house we are in has a waterbed for the master bed – and it is so hard for me (Nikki) to get used to! I never imagined this would be one “hurdle” in my culture adjustment! Dirt. Everywhere. It is a fine-reddish-colored dirt, and it is literally everywhere you go. Most side roads are unpaved and so this dirt floats up to meet you every step. I don’t mind it (yet) and it is a very obvious reminder that we are on the edge of the Sahara Desert and in a country without the infrastructure to build fancy sidewalks and roads. Driving. This topic has it’s own category since the roads here rival my most terrifying memories of driving in Italy with my family in the 80’s. It appears that there are no rules, but upon further education there ARE rules but they vary from traffic circle to traffic circle. On a two lane road (going both ways) you will compete to hold your space with motorcycles (everywhere), bicycles, people on foot, donkeys pulling wagons, people pulling wagons, camels, goats, small taxis, and of course other cars. At night many of the bicycles and motorbikes do not have lights so you have to really stay focused. At first it seems like complete chaos but after a time or two of driving, it can actually be a fun challenge. If you are going a bit slow, you will get passed but no one seems angry or frustrated – it’s just part of the flow. One big deal (which I think is funny) is the importance of using your blinker properly – the police will ticket you for NOT blinking on a turn, and even ticket you for blinking the wrong way! I find this comical mostly because the real “crime” seems to be the hazardous lane changes, passing, and many types of animals crowding the roads! Andy has done most of the driving so far, but I took my first turn today – pray for us! People. We’ve met lots of SIM missionaries and heard about their work. What a diverse bunch of Christ-followers! 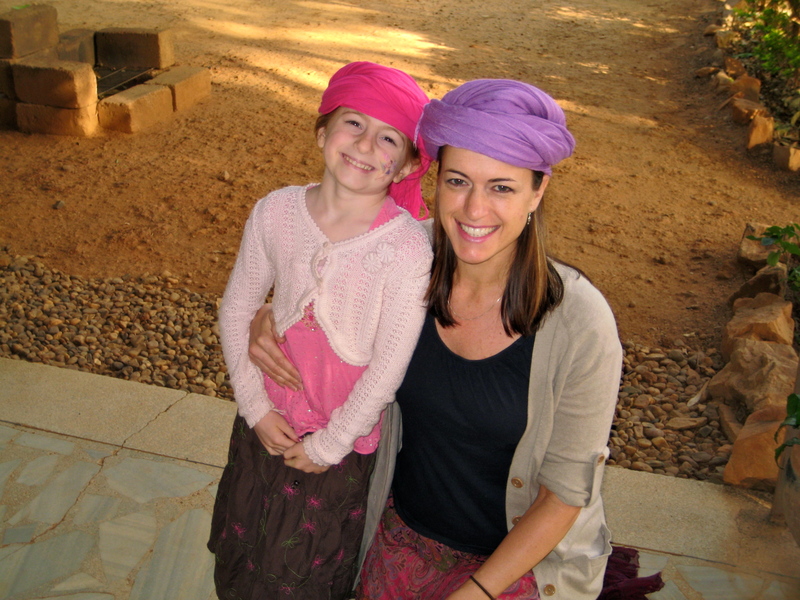 So many gifts to offer, and creative ways to serve the people of Niger! It has been inspiring in many ways and we are so grateful to be here and learn about this little-known country (to man) but very-known country to God. The Nigeriens (people from Niger have the “iens”, and people from Nigeria have the “ians”…FYI) are precious, gentle-natured, and our contact with them has been always good. They have a generally positive view of Americans (we are told) and this has been our experience. Very few speak English so we are reduced to sign language and gesturing to communicate. This is the most frustrating part! Clearly our contact with Nigeriens will be more profitable when we can actually speak French! Atmosphere. Or ambience? We observe that this country has a peaceful easy feeling and there is an absence of hostility. Our kids even remarked that “most kids in America would probably think that Africa is so dangerous and the people even more dangerous, but in reality it isn’t true!” Even on really busy streets near the market, when people are literally pushing their way up to our car, begging for food or money…it doesn’t feel unsafe. One other observation about life here – there are people everywhere, at all times of the day and night, just walking or riding bikes or selling things…it is a place full of activity all of the time. Always buzzing. We think this is because they don’t have big fancy homes to hang out in, and their communities are where all of the action is – so they simply walk around and visit with each other? We hope to find out more… so stay tuned. On our way to school from the city -- a common sight! – Goats: roaming the streets of Niger are little packs of wild goats! – Mosquito nets: the kids have mosquito netting over their beds now (it took a little rigging to get them set up) and after their first night I proudly asked if everyone was mosquito-bite free? Nathaniel announced that he got some new bites….hmmm…well, tonight we discovered the culprits safely hiding INSIDE near the top of his mosquito net! Whoops! Probably a good idea to make sure the mosquitos are OUT of the net before sealing up for the night! – Thankful for flashlights: power outages are common here. 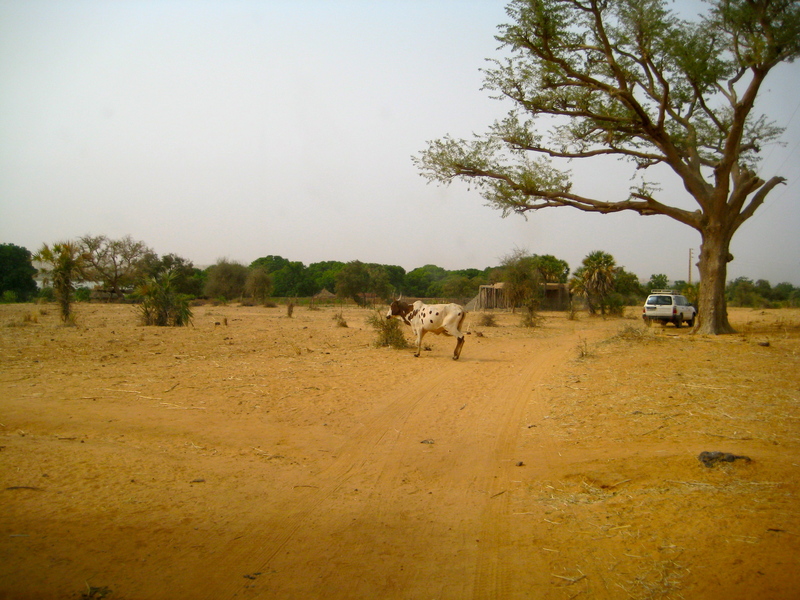 – Nigerien Christian Church: two hours of French translated to Housa (one people group language here). The five of us enjoyed our first church service in Niger! We didn’t understand a single word of it – but recognized some of the worship songs by their tune. It was a true blessing to be among the precious Christians of Niger, as they worshipped God and preached His Word! “Sweet sweet spirit in that place” we all agreed.